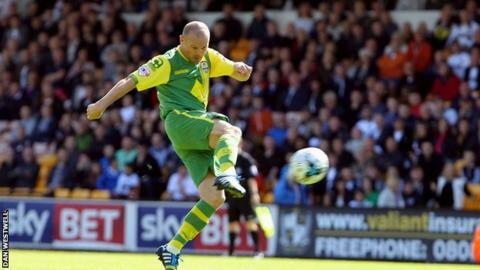 Notts County made it two wins in a row with an away victory at Port Vale. The visitors went ahead through veteran midfielder Gary Jones, who netted a first-time volley from 30 yards. The home side brightened up in the second-half, Roy Carroll making a terrific save from Tom Pope before Mark Marshall went close. But Liam Noble's 87th-minute free-kick from 25 yards deflected off the defensive wall and swerved low inside the post, securing all three points. "It was an incredible defensive display from us. You have to be brave in many ways and I thought we were brave defensively - and all over the pitch. "I know that Port Vale will be disappointed with that, but you have to find a way of winning games and we managed to do that. "I thought big Jake Cassidy was absolutely unbelievable up there, occupying both centre-halves when we had the ball and made it difficult for them when they had the ball. All over the pitch, to a man, I'm so proud of them." Match ends, Port Vale 0, Notts County 2. Second Half ends, Port Vale 0, Notts County 2. Corner, Port Vale. Conceded by Haydn Hollis. Roy Carroll (Notts County) is shown the yellow card. Tom Pope (Port Vale) is shown the yellow card. Corner, Port Vale. Conceded by Roy Carroll. Attempt blocked. Colin Daniel (Port Vale) right footed shot from the right side of the six yard box is blocked. Attempt blocked. Mark Marshall (Port Vale) right footed shot from outside the box is blocked. Attempt missed. Michael O'Connor (Port Vale) right footed shot from outside the box is close, but misses the top left corner from a direct free kick. Goal! Port Vale 0, Notts County 2. Liam Noble (Notts County) from a free kick with a right footed shot to the bottom right corner. Attempt blocked. Tom Pope (Port Vale) header from the centre of the box is blocked. Liam Noble (Notts County) is shown the yellow card. Attempt blocked. Mark Marshall (Port Vale) right footed shot from the centre of the box is blocked. Substitution, Port Vale. Louis Dodds replaces Frederic Veseli. Attempt missed. Jake Cassidy (Notts County) right footed shot from the right side of the box misses to the right. Attempt saved. Zeli Ismail (Notts County) right footed shot from outside the box is saved in the bottom left corner. Attempt missed. Colin Daniel (Port Vale) left footed shot from the centre of the box is close, but misses to the left. Corner, Port Vale. Conceded by Curtis Thompson. Attempt blocked. Mark Marshall (Port Vale) header from the centre of the box is blocked. Attempt saved. Colin Daniel (Port Vale) right footed shot from the centre of the box is saved in the bottom left corner. Attempt saved. Tom Pope (Port Vale) header from the left side of the box is saved in the top right corner.